To the folks in the room, it was a celebration of life’s two finest creations: books and food. 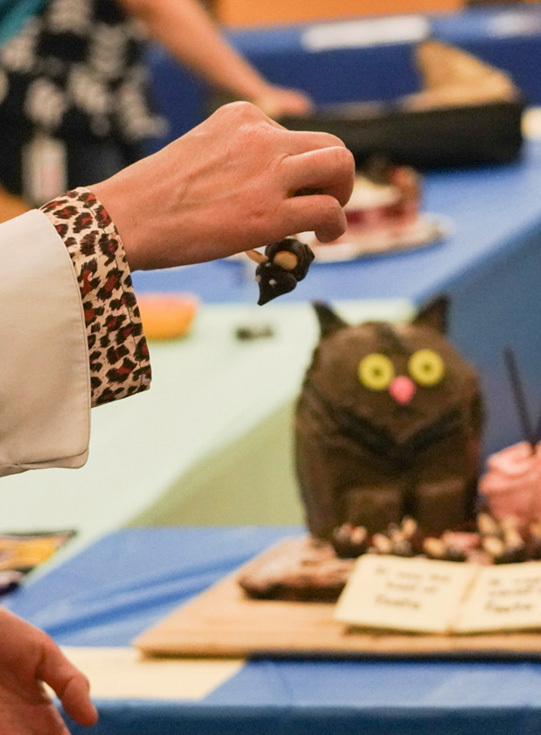 This week, bookworms and foodies alike crowded into Moffitt Library for the Edible Book Festival, an annual tradition recognized around the world. 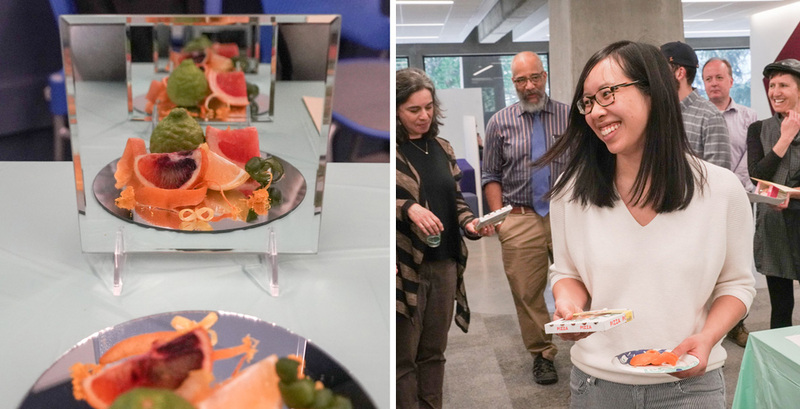 The festival, now in its third year on campus, challenges participants to answer the question: How do you translate a beloved text into an edible delight? Taking over the center of Moffitt’s fourth floor were 16 possibilities, including The Tails of Two Kitties, a chocolate-frosted masterpiece; Tart of Darkness, a heart of greens atop a savory spread; and The Communist Antipasto, a salami-bound tome filled with pages of cheese. The event is free to enter and open to faculty, staff, and students. The prize categories this year were Punniest, Eye Candy (or Most Aesthetically Pleasing), Least Edible, People’s Choice, and Best Student Entry. The judges, who selected and announced the winners in each category, were Anna Livia Brand, a professor in the College of Environmental Design; Rosalie Z. Fanshel, with the Berkeley Food Institute; David Faulds, with The Bancroft Library; Cecil Giscombe, an English professor; and Alexander Wilfert, ASUC president. 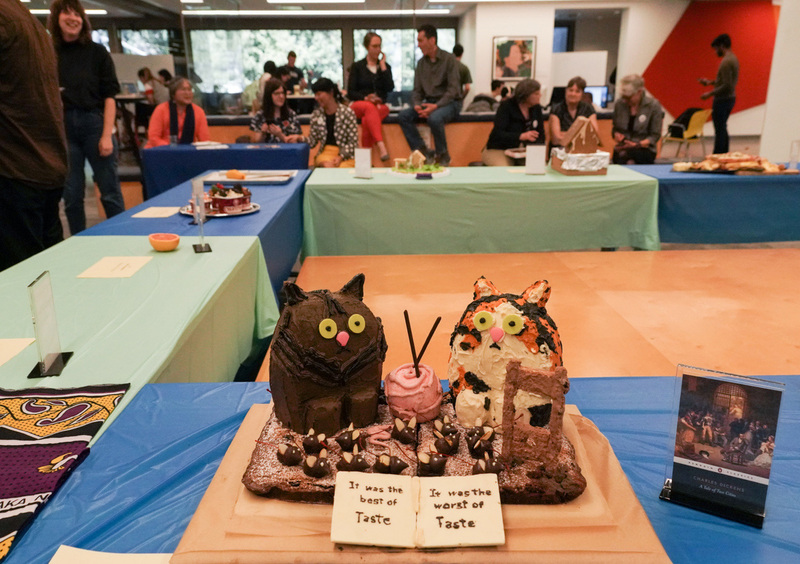 Susan Powell, a member of the event’s planning committee, said the diversity of the judging panel reflects the range of factors within edible books — from literary puns and aesthetic appeal to structural design and flavor profiles. Amy Dinh, right, collects her prize for her entry Infinite Zest, at left. One crowd pleaser was Infinite Zest, a play on the lengthy David Foster Wallace classic. Arranged meticulously on a small mirrored platform were ribbons of lime peels, sprinkles of lemon zest, and quarters of pulpy pink grapefruit. Standing at front and back of the display were two mirrors, reflecting the citrus into infinity. The piece, by Amy Dinh and Kyle Shimek, won an Edible Mention award. “I knew it wouldn’t be the most complex but that it could be minimalistically beautiful,” said Dinh, a manager at the campus’s Jacobs Institute for Design Innovation. 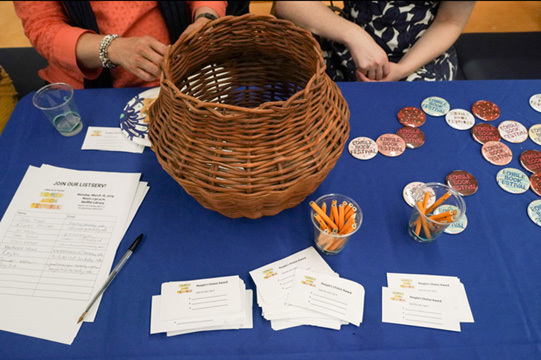 A voracious reader and lover of “creative playfulness,” Dinh visited the festival last year and “was so tickled by the entries” that she knew she had to participate this time around. “It’s so simple, and it’s so perfect,” said Jean Retzinger, a professor of media studies, of the piece. “It’s just brilliant. A three-time veteran of the festival, Retzinger submitted Tart of Darkness, inspired by Joseph Conrad’s dark tale of white colonialism in the Congo. While the book was painful to read, she said, it was fun to reimagine the work as a tasty treat. For Retzinger, one joy of the festival is to witness the wide range of ways that people interpret, respond to, and re-create books. 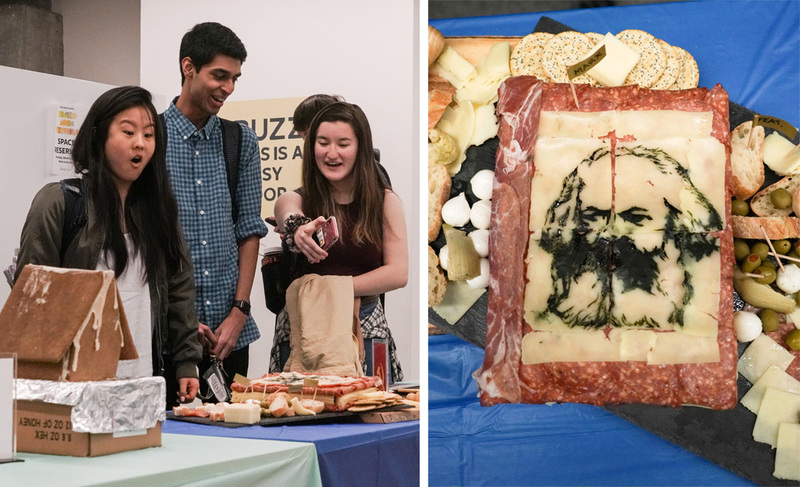 Visitors react to The Communist Antipasto entry, at right, created by Ricky Brown. The winning student entry, The Silent Lambs Escape, by freshman Jolea Schwindt, is one example. Based on the thriller novel The Silence of the Lambs — which features a cannibalistic serial killer — Schwindt’s adaptation was a bright and cheery confection, with fondant lambs flying freely past a fence. 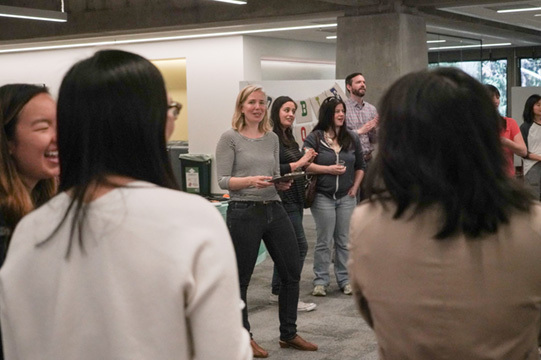 “I really love this piece because it’s turning a very dark, somber book on its head and making it positive,” said Wilfert, the ASUC president, announcing the award. Going forward, one goal is to continue to attract more students to the event, Powell and Reardon said. The festival has grown in size every year, and the Library team plans to keep the tradition going strong. “I just love to see students celebrating book culture and sharing the books that they most love,” Reardon said. The winners this year were: The Tails of Two Kitties, by Joan Kask (Punniest); The Communist Antipasto, by Ricky Brown (both People’s Choice and Eye Candy); The Life-Changing Mango of Tie-Dying Up, by Janhavi Deshpande (Least Edible); and The Silent Lambs Escape, by Jolea Schwindt (Best Student Entry). Two entries received Edible Mentions: Infinite Zest, by Amy Dinh and Kyle Shimek; and The Golden Bao, by Michele Rabkin. Top to bottom: Clockwise from left: A visitor digs into a chocolate mouse, part of The Tails of Two Kitties entry — one of many that guests were allowed to eat after the judging; voting ballots and buttons sit on a table for visitors; and Susan Powell, GIS and Map Librarian, announces some of the winning entries.